We can provide either special outdoor or food & wine tours for repeat visitors or give added value to first-timers with special activities not found in standard itineraries. David Perlmutter founded Israel Adventure Journeys Ltd. in 2015 to enable him to use his 25 years of experience guiding in Israel and Jordan to provide his “out of the box” experiences to a larger public. David has personally chosen a team of excellent guides that share his passions and give added value to your tour of Israel. If you enjoy outdoor activities, let me bring the outdoors into your tour of Israel. Whether you want to hike, mountain bike or access off the beaten path sites in our SUVs, Israel Adventure Journeys Ltd. will take you places few tourists get to see. While Israeli wine is under most people’s radar, Israel has a growing wine industry that is increasingly receiving international acclaim for its wines. 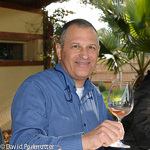 Israel Adventure Journey Ltd.’s founder, David Perlmutter has grown with Israel’s reborn wine industry. David’s many friends among Israel’s leading winemakers, lets Israel Adventure Journey Ltd.’s Wine Tours get personal, meeting the people behind the wines. Our guides are certified as Wine Tourism Experts by Israel’s Ministry of Tourism and are Licensed Tour Guides with the training, knowledge and experience to integrate ancient wine presses in his tours to learn about the central role wine played in everyday life in ancient Israel. Transportation for all tours is provided by vehicles licensed for tourism with full passenger and liability insurance for your safety.